It is very doubtful whether sugar-cane occurs anywhere in the wild state, at present. Authorities are quite unanimous in expressing it as their opinion that its original home was India. 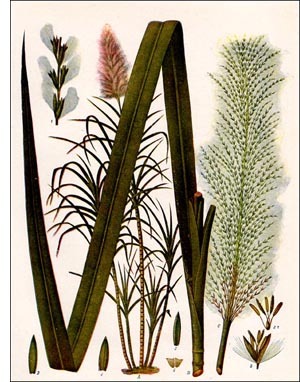 It is a plant that has been under cultivation for many centuries. There are many varieties recognized by cultivators, differing in color, texture, and other minor characteristics. Since cane does not ripen fruit, it is propagated by transplanting the rhizomes and top portions of stem. The ripe cane is cut close to the ground, the leaves stripped off, and tassel cut off. It is then carted to the cane mill and passed between large rollers, which express the juice, which is then clarified by means of lime, animal charcoal, and blood. The juice is boiled until it acquires a proper tenacity, when it is passed into a cooler and allowed to crystallize. This sugar is then placed in large perforated casks and allowed to drain for two or three weeks, when it is packed into hogsheads and exported under the name of raw sugar or muscovado sugar. The drainings form molasses. Raw sugar is taken to the sugar refinery and purified. Sugar has innumerable uses. As an article of food it is not surpassed, though it cannot support life alone, because it contains no nitrogen. It is the important ingredient in candies, pastries, sweetened drinks, etc. Molasses and treacle are much used and must not be confounded with the sorghum molasses made from the sugar cane of the Central States. Molasses and treacle sometimes have a very peculiar and, to many, a very objectionable flavor, due to impurities present. Molasses, as well as treacle, when fermented, gives rise to rum. The popular notion that sugar is injurious to teeth is without foundation. In medicine sugar is employed to disguise the taste of disagreeable remedies and to coat pills. It has no direct curative properties in disease.